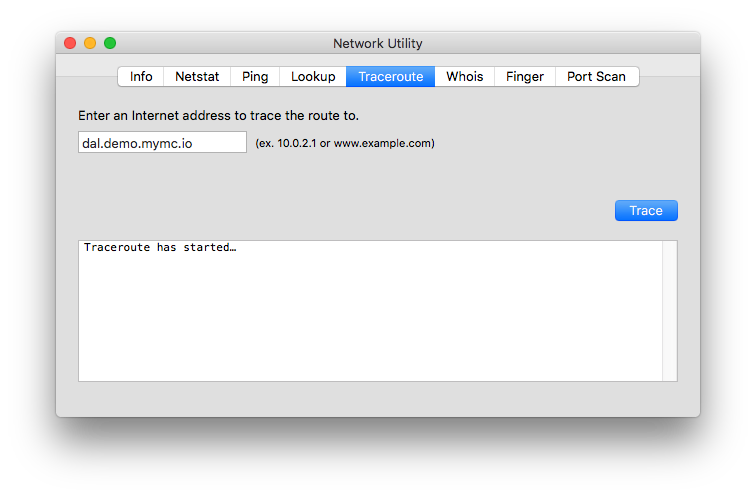 How do I perform a traceroute in Mac OS X/macOS? For this article, we'll assume that you're running the latest version of macOS. At the time of this writing, it is High Sierra using version 10.13.6, but should still be relevant for any recent versions of Mac OS X/macOS. First, you'll want to use Spotlight (⌘ + Space) to open Network Utility. Next, click on the Traceroute tab and enter the destination provided by our support team; this will normally be your server's IP address. Click Trace to begin the traceroute. Once the traceroute has completed, click inside the box, hit copy the text (either ⌘+A & ⌘+C or select all the text and right click and click Copy), then copy/paste the output to our support team via your support chat with our team. If you have any questions or trouble running the traceroute, please let our team know via the support conversation you're already having or click the blue button at the bottom right of the page and open a new conversation.